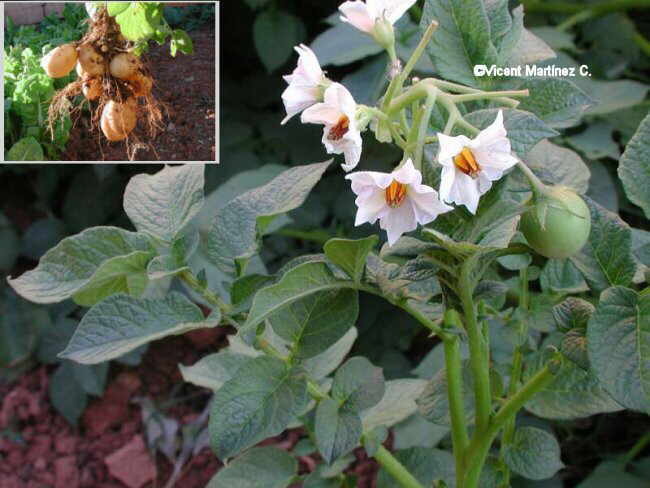 Photo of Solanum tuberosum L.
Herb with tubercles of the Potato family -Solanaceae- up to 130 cm. Leaves pinnate with ovate or heart- shaped leaflets. Flowers in cymes, white or violet, till 4 cm in diameter, with very conspicuous yellow anthers. The fruit is a black berry, poisonous like the rest of the plant except the tubercles (potatoes). Native from America but cultivated everywhere. Sometimes naturalised.